Hi, I am Jørgen Steen from Norway. I am one of the counsellors of World Campus. My responsibility is the technical stuff and the video blog. So today was Arigato Event day. The busiest day for me. This is because on top of being part of all the activities and the normal work, I also have to make the collect pictures from everyone and make a slideshow from this weeks event. 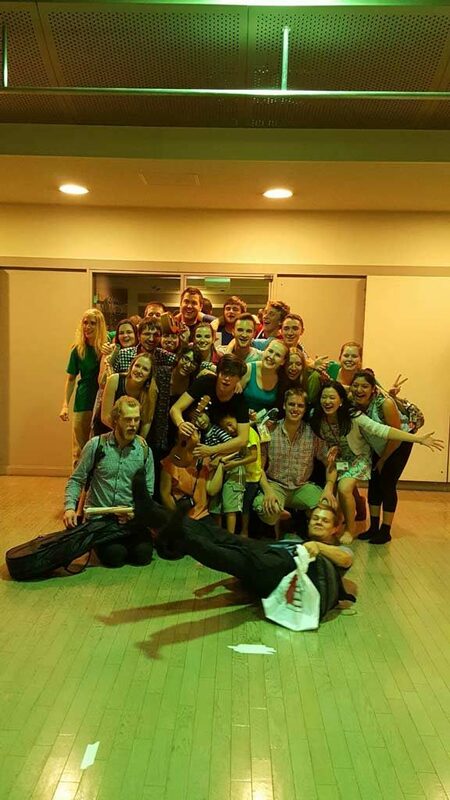 For those who do not know, Arigato Event is a 2 hour event where we dance and sing for our host families to show our gratitude towards their hospitality. And on top of that this was the last day of the session so I also had to film a lot of video blogs. The day started with a meeting as all days do; we talk about today’s events in detail so the participants know more specifically what they are going to do that day. After that we went to make dream maps. Dream maps are something that they do in Japan to manifest what you want in your life. It is divided into 4 areas and then you present it like it has happened. We were going to present it at the arigato event. First what you want to have, materials goods. Second is what you want to become. Third is who you want to make happy and who you want to have in your life. You do not use specific pictures from this just like a girlfriend/boyfriend, parents, children etc. Lastly you put pictures of what kind of world you want. So we sat down with some Japanese students and started to cut in newspaper and magazines and glue the pictures on our piece of cardboard. When we all were done we presented some of them as practice for the real deal. About half of us did it serious and the rest kind of joked around with it. Mine was kind of a joke, as I did not have a lot of time since I had to film a special kind of end of the session video blog. “A message to the next year’s participants”. It is to counter the lack of knowledge of what we do in World Campus that a lot of people actually have before participating. When the dream maps presentation was over we went to make mochi, which were quiet good after I sprinkled them with some sweet sesame powder. For lunch we had Japanese curry. I am not a big fan of that, but this time it was kind of good, maybe it is growing on me. After I hurriedly ate lunch I started to transfer the participants’ pictures to my computer and started to make the slideshow. So while the participants and the other counsellors had the end of the session wrap up, I worked with the slideshow. I didn’t finish in those 2 hours they used, so I continued while they had breaks and practised for the arigato event dances and songs. After I was done I went straight to work on all the technical stuff for Arigato Event. I have to check the volume for all the microphones, the songs we are playing, check that the projector is working as it should and etc. The Arigato Event was fun and worked out well. After that we had a pot-luck party where all the families brought different kinds of food. There was a lot of good stuff there! While we ate someone performed a sort of geisha dance. When everything was over I went home showered, packed and hang a little with my host family before going to bed. Festival day is a busy day for the World Campus participants. At the end of sessions two we joined the festival in Isehara and we became part of it. 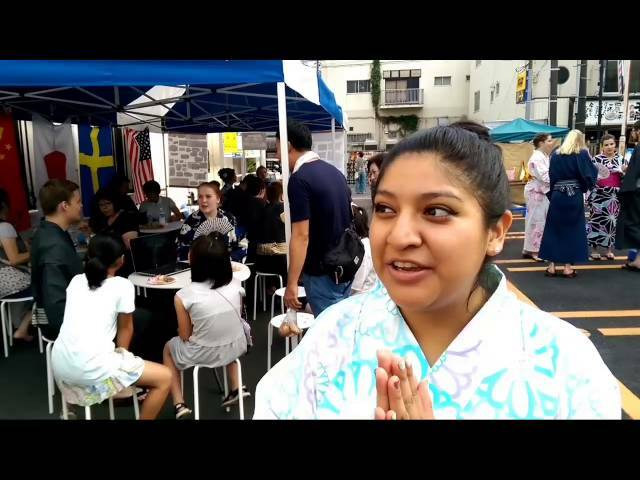 This time Axel and Aimee talks about their experience with the festival. 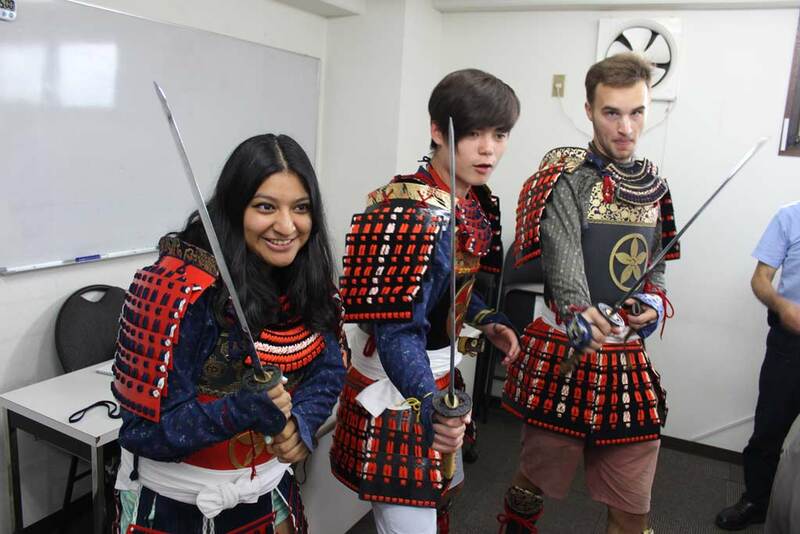 Today we in the World Campus – Japan program went to a summer festival. I had been looking forward to it ever since I had heard about it, and it ended being a bit different from what I had anticipated. Some of it was honestly a bit disappointing while it still ended up being a very fun and memorable day. We started the day meeting up in a building at the street where the festival was going to be held. We had a meeting, going through what was going to happen during the day and what we were supposed to do. After this we got an assignment where we would get a piece of paper each that we would then pass around to the people around us and write down our honest thoughts of each other. After this we had lunch, a short break and then it was time to change into the kimono that each and everyone of us had gotten as a gift. I am a bit taller than most so the kimono did almost not fit me but I still liked it and the sandals we got were not terribly uncomfortable either, it was time for the festival to start. Surprisingly, I enjoyed working at our tent more than I did the actual festival. The world campus tent was a café where you mostly got something to drink and then chatted with us participants. Me and my Swedish comrade talked with quite a few different people through our shifts, and I did enjoy all of it. Other highlights from the festival would be the nagashi somen that almost run through the entire street. Nagashi somen is when you have several pieces of cut bamboo with water running through it. Somen noodles run with the water and you try to fish it up with chopsticks and eat it. I find really fun but I had already tried it and the line to get chopsticks was long so I ended up not participating in this event. There was also a troupe of samba dancers who regularly danced through the entire street and a bit more. I had not expected the samba dancers. Once I had seen the whole festival, all the tents and such, I was a bit disappointed because there were mostly food stands and I could not find any interesting food. Nevertheless, the festival was ending and the last event was a sort of discoish dance that we learned on the spot and participated in. Part of why that was fun was because we danced in our kimono and sandals which made it all feel a bit more accomplishing. The dance was a surprisingly fun ending to what had been a surprisingly fun day although for me the kimono was the highlight of the day. I think the kimono is one of the best souvenirs I could have ever gotten on my own and I will surely remember this day if only for that. Every week there is a host family day, where we spend the whole day with our host families doing activities they have planned. We spent most of the day in the back yard, where we had a barbeque with friends of the family. We had a great time comparing Norwegian and Japanese phrases, and talking about Norwegian food and geography. We played a game where one is blindfolded, and had to hit a watermelon with a wooden sword after spinning in circles and being directed by the audience. After many near hits and misses, we managed to break it, and we shared the carcass among us. We also visited one of the friends who lived nearby, and spent the rest of the evening playing billiards with the other WCI participants at a bar. It was really nice to spend more time with the family so I got to know them better, and to see how they interacted and talked with their friends. 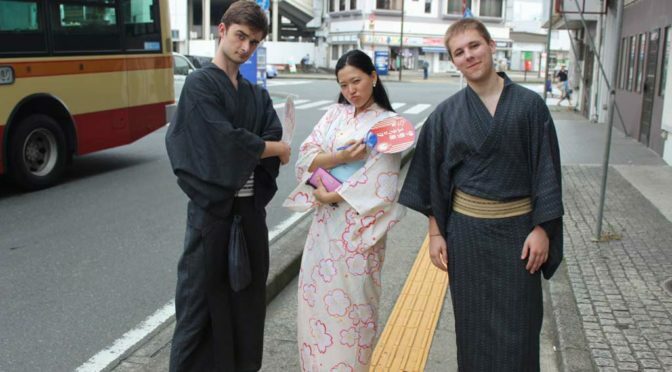 You really get a unique perspective on how life is in Japan this way. The host family days were probably the best days of the program, so if you are going, look forward to them! 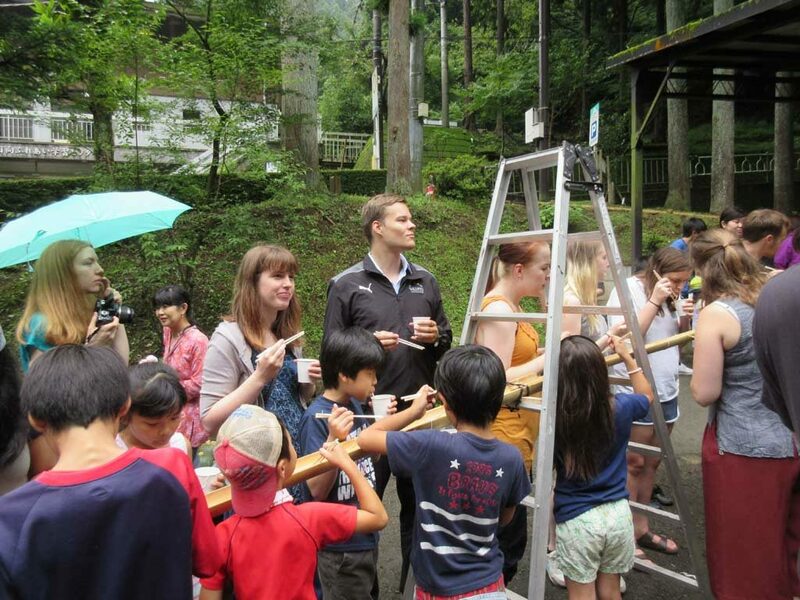 World campus visits Oyama primary school and learns to use a koma. We also get our names written in kanji. 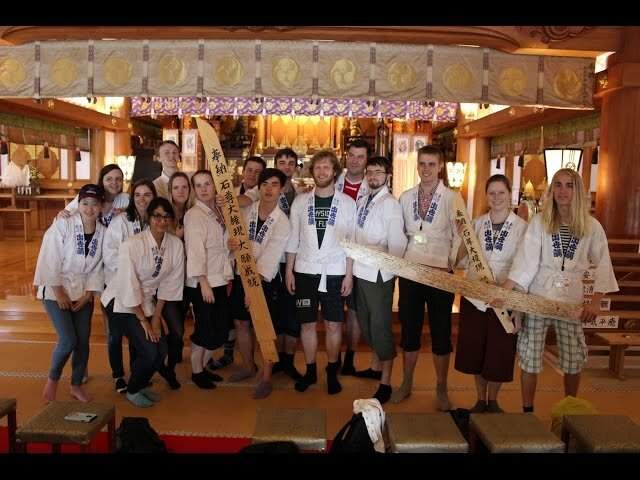 After that we travel to Oyama mountain and get a tour around the shrine by a very entertaining priest.